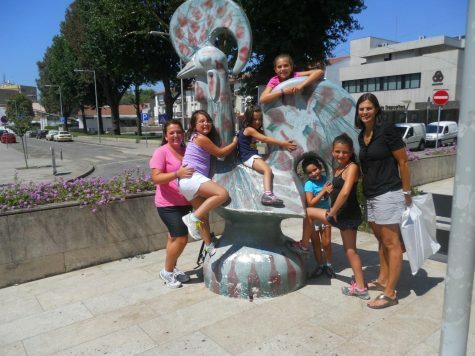 At a young age of 10, my friend Alexa and I got to travel to Portugal with our moms. This experience created lifelong memories that will last my whole life time. When I am older I hope to take my children, so they can experience everything I was able to. In my opinion one of the biggest challenges when looking to travel to foreign places is not knowing the land or the langue’s. If me and my mom were go alone it would have been a whole different experience, but thankfully we did not. Alexa’s mom, Mrs. Machado was born and raised in Portugal. That meant that she spoke Portuguese and knew the land. This made the trip easy for me and my mom because she knew everything. After the long 10-hour plane ride we were greeted by Mrs. Machado. When we got there, we used the bathrooms. The first thing we found out was that the people in Portugal were a lot smaller than Americans. The bathroom was very small and my mom, being six feet tall had to bend down. We then drove a long 2 hour back to their grandparent’s house in Vale De Cambra. When we got to the house we were greeted by Alexa and her sisters Tait, Maia, and Nikki and also her grandparents. When we walked in the house once again my mom hit her head. Alexa grandparents then cooked us an amazing traditional Portuguese dinner with lots of rice. The next day we went to a festival with shops and performances. On the way home, we got a flat tire on the highway. The speed limit on the road was about 140 km/h which is around 90 miles per hour. This was so scary because every time a car drove by the car shoke. We got a spare tire and finally made it home safely traveling on the highway driving 20 miles per hour. The next day we drove to Alexa’s beach house in Algarve. We spent the few days on the beach then drove to Lisbon. Lisbon is the capital of Portugal. When in Lisbon we went sightseeing and went from place to place learning this new interesting culture. During the long drive on our trips from place to place, we went stopped along the road to see many different sightseeing spots. In my opinion that was my favorite part of the trip. I got to see other countries and what was important to them. I learned from this trip that the best experience in another country is with someone who knows and speaks the language. When we went out to eat Mrs. Machado would order for us and when traveling she knew the best places to stop. Being able to experience a country like this changed the way I thought about other parts of the world. I am thankful for this experience every day of my life.